I got to know Tanoue-kun - Mr. Kiminori Tanoue - when he was still a student. Tanoue-kun was sent to Frankfurt where I lived by Fukuoka Prefecture as a new hope of its venture business and made a presentation of his 3-D works in a digital trade fair. I was fascinated by his "Usao". A rabbit shaped computer pet that is expected to manage digital works in the PC. However, Usao is lazy and tries to sleep further despite the persistent trial of the pointer to wake him up and make him work. Finally, Usao stands up furiously because he is disturbed in his sleep, tortures the pointer and tries even to get out of the PC and attacks the owner of the PC in the real world. Usao is a sweet and cute character - in Japanese "kawaii kyara" - and young people can easily understand his anger, because most of them have similar experiences, namely being disturbed by mama during comfortable morning sleep with her hysteric "get up" call. I showed the Usao movie to many young people in Germany and Denmark and they were equally fascinated by the sweet Usao. They sympathized with Usao in his innocent anger and applauded his brutal way of revenging the pointer. We gathered in Bar Moskow. From left: Tomitaka-kun, Seo-kun and Tanoue-kun. 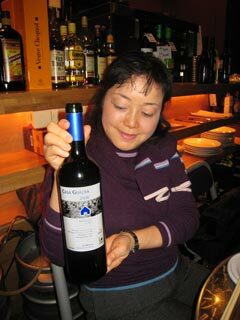 And Fukazawa-san chose Tempranillo for thirsty guys. If you put your cursor on the bottle, the etiquette will be enlarged. In the meantime, Tanoue-kun graduated from Digital Hollywood, Fukuoka, and founded his own digital motion picture company. 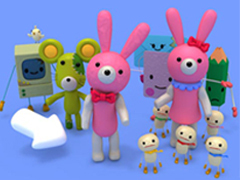 Usao became a mascot of the Fukuoka TV for years and showed his kawaii appearance in Kyushu province. Usao is followed by many other cute characters, which are also active in various occasions. 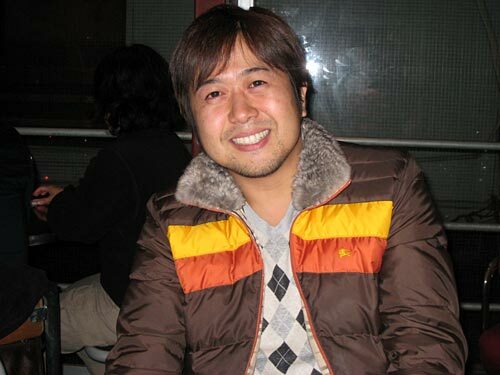 The main business area of Tanoue-kun's company, HappyProject, Inc., is the production of public relation movies. Now, Tanoue-kun wants to expand the activities to character business and has opened a new internet site Chalab. In Chalab, you can see his large palette of characters and enjoy sample movies. You may use those characters if you reach agreement with Chalab. You can further ask Chalab to create a new character to meet your needs. Chalab is now operated only in Japanese language. But, Tanoue-kun intends to expand it to English and other languages, so that Chalab will be accessible to foreign people who may be interested in Japanese kawaii characters. Tanoue-kun lives in Fukuoka and his company is also located there. However, he regularly visits Tokyo, because he has also business relations in the metropolis. This evening one of his business partners Tomitaka-kun joined us, because he just moved from Fukuoka and Tokyo and wanted to meet his regular drinking companion in Tokyo. Tomitaka-kun was accompanied by his old friend, Seo-kun, a class mate from the high school days. Seo-kun happened to work in the company where my friend and viola player, Saeki-kun, works as secretary of the labor union. Both Tomitaka-kun and Seo-kun were brought up in Kichijoji, though they do not live there any more. Anyhow, together with Fukazawa-san - a colleague in my office and a member of the Japan Sommelier Association - we enjoyed bottles of Tempranillo wines in the Bar Moskow and fascinating conversation.